Truck Accident Personal Injury & Wrongful Death Accident Lawyers Sierra Madre, California! Need Experienced and Trusted Truck Accident Attorney and Legal Experts To Handle Your Sierra Madre, Los Angeles, California Personal Injury and Wrongful Death Claims? We are a team of talented truck accident attorneys serving injured persons in Sierra Madre, California. Having a vast 4-decade-long experience in concentrating on wrongful deaths and personal injury claims in Sierra Madre and all of L.A., our truck injury accident lawyers fight for maximum compensation for our clients and do our best to help them seek justice. Besides catering to the legal needs of our clients, our Sierra Madre truck accident injury lawyers are compassionate towards them and assist them with finding medical care, resolving property damage claims and negotiating the best possible settlement to resolve their injury claims for all hospital and medical care, loss of earnings and all pain & suffering. Our personal injury & wrongful death lawyers provide our Sierra Madre truck accident clients with a FREE and confidential consultation and we work on contingency fees which mean there is NO fee until you win! Just give us a call now at 818-222-3400 or 1.866 INJURY 2 (after hours press “1”) or just CLICK HERE 24/7 for your FREE consultation! Vehicle Repairs: Sierra Madre traffic road accidents can disable your truck, car or other vehicle. Our property damage lawyers and legal team assists you with towing, storage, repairs and if it’s a total loss then settlement and replacement. We also help with free loaners and rental cars and trucks. Medical Care: A truck accident is bound to result in serious injuries, signaling for expert doctors and other medical help. Mindful of the fact, we seek out doctors and other medical professionals for our clients. These experts usually deliver care and treatment without asking for the payment until your case is resolved. Thus, you can get needed medical care without worry about payment now – not even co-pays or deductibles until your case is resolved! Cash Advances/Emergency Loans: Truck, car and motorcycle accidents in Sierra Madre, Los Angeles can have a serious effect on your physical and mental abilities. In many of such instances, your sound financial state takes the impact. Medical bills mount up and income and earnings may be diminished! However, we often can help you in obtaining cash advances or loans. Transportation to Doctor: We arrange medical visits for our clients. Additionally, if you need transportation, we often can arrange transportation to and from doctors and physical therapists. For more information on what we can do to assist you, please click here. Successfully resolved thousands of personal injury cases over 40 years! Recovered monetary compensation over $100,000,000.00. Have a success rate of over 95% in our personal injury & wrongful death accident cases. Contact us now for truck accident or personal injury consultation in Sierra Madre, CA. Just click here 24/7 for a FREE consultation and with our Sierra Madre truck accident personal injury & wrongful death accident lawyers there is NO fee until you win! Further, visit our lawyer profiles to know about the qualifications and academic background of our expert wrongful death attorneys. In addition, get an insight into the complex process of handling truck accident claims. Read through our Truck Injury Accident Web Site; and for more specific advice about your own personal injury or wrongful death accident claim just call us now at 818 222 3400 or 1.866 INJURY 2 or click here. 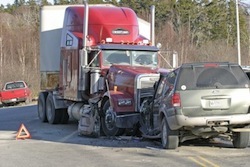 Truck accidents in Sierra Madre cause devastating injuries, sometimes even deaths with wrongful death accident claims. Located in Los Angeles County, California, the city of Sierra Madre has a population of 10,917, as per 2010 US Census. Further, the town of Sierra Madre has a total area of 3.0 square miles. Also known as “Wisteria City”, Sierra Madre is located in the foothills of the San Gabriel Valley and below the southern edge of the Angeles National Forest. The neighboring regions include Arcadia to its east and south and Altadena and Pasadena to its west. Moreover, it lies between Michillinda Avenue to the West and Santa Anita Blvd to the East. Further, to the South lies Orange Grove Boulevard. Additionally, the principal road is Sierra Madre Boulevard. 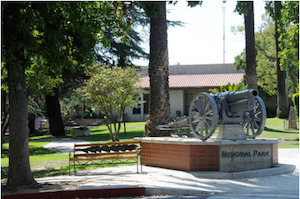 Some of the historic landmarks in Sierra Madre include Old North Church of Sierra Madre Congregational Church, Sierra Madre Pioneer Cemetery, Hart's house in Sierra Madre Memorial Park, and the Episcopal Church of the Ascension. Notable residents of Sierra Madre include Louise Gunning, an American soprano singer, who died in Sierra Madre, California. Moreover, Alan Stevenson Wood, an American retired naval officer, was a scion of one of the first pioneer families, settling in the modern-day Sierra Madre. Additionally, Gutzon Borglum, a Danish-American artist and sculptor, lived in Sierra Madre, California. 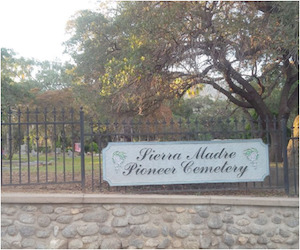 Sierra Madre has been a filming location for various popular motion flicks, including The Great Man's Lady, The Seven Little Foys, Halloween (1978 film), Testament, Twin Peaks, and A Family Plot, among other popular motion pictures. For a quick FREE & CONFIDENTIAL legal consultation, fill-out the details in our contact us form and inform us about your Sierra Madre, CA truck, car or motorcycle road accident case. Besides FREE consultation, we do not ask for payment until your claim has been settled. We work on a contingency fee which means on injury accident cases we only get paid when we win and then our fee comes out of the recovery, usually paid by the insurance company and not from your own wallet!